Anarchy Enterprises announced Coffee Tycoon www.coffeetycoon.net will be release in early spring 2005 for the PC. The strategy game is being developed by the makers of Moon Tycoon, Deep Sea Tycoon, and most recently National Lampoon's University Tycoon. Coffee Tycoon is filled with dozens of charming characters who will offer up their opinions, good or bad, on the quality of the player's store. 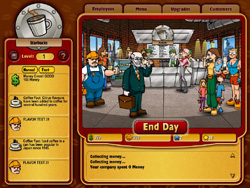 Players can choose from a hundred store upgrades and coffee recipes to customize their business. •	5 different company logos and coffee store styles to choose from. •	5 starting cities: New York, Miami, Chicago, L.A., and Seattle. •	Dozens of game characters and personalities. •	100 store upgrades and coffee recipes. •	Hundreds of unique events and bonuses.